This demo class takes fermented foods a step further – how to make your own! In this class, see how to make fermented vegetables! HOW do we make and easily incorporate these super probiotic-rich foods into our meals? It’s easier than you may think! Boost your gut health and veggie fermenting confidence! This class briefly explains the who, what and why but focuses on LIVE demonstrations showing you step-by-step EXACTLY HOW to prepare homemade fermented veggies. Students will even have a role in one of the preparations! Full demonstrations and recipe packets are included. PLUS! Stay for brunch at True Food Kitchen and enjoy 15% off! $37 per student. Register today to save your spot HERE! What’s the deal with probiotics & fermented foods? Did you know that we need ample good bacteria for our best health? Discover the importance and deliciousness of fermented foods and fermented beverages. We’ll discuss why gut health/digestion is the biggest foundation of health and how poor digestion affects health - inflammation, fatigue, fat-loss & body composition, chronic disease & more. Explore the different types of fermented foods/beverages that are out there, how to incorporate them into your food lifestyle & how to find good quality commercial varieties. $35 per student. Register today to save your spot HERE! 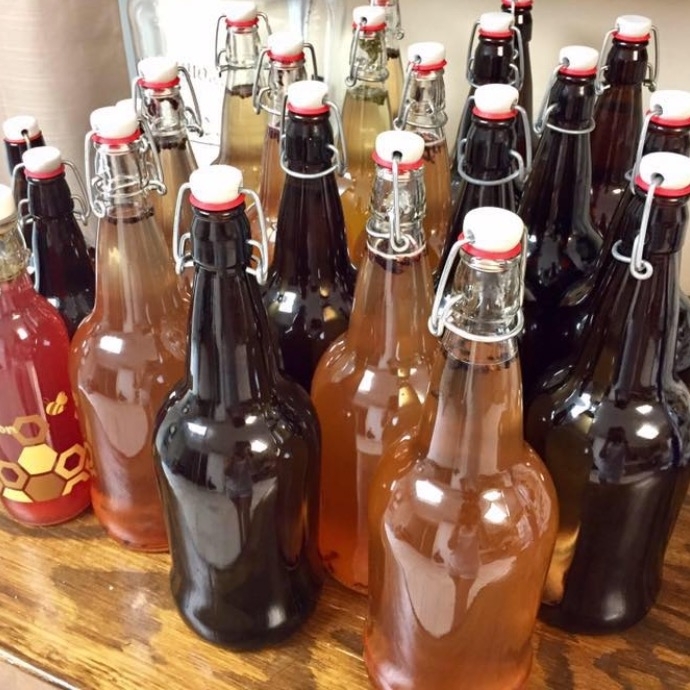 Homemade Probiotics: Crazy for Kombucha! Kombuch-what?! Find out why and how to make this REAL & ALIVE probiotic-rich beverage. See LIVE step-by-step demos showing you EXACTLY HOW to prepare kombucha. Receive complete instructions & recipes for your own kombucha brewing adventures in your own kitchen! PLUS, take home a FREE Kombucha starter culture (bring a jar)! Recipe packets included. To register and save your seat, call Maryland Homebrew at 410-290-3768. Farm Tour at Hensing's Hilltop Farms in Dayton, MD! Come to a FREE local FARM TOUR to see how animals are naturally raised! You will see how a pastured, 100% grass-fed farm is truly sustainable. This results in healthy animals and therefore healthy food for you! Hensing’s Hilltop Acres raises their animals the right way! They do not use chemicals, insecticides, antibiotics or growth hormones. The animals live the way nature intended. Also, you will have the opportunity to purchase meats and raw milk that day, so bring a cooler! It's time for YOU to ferment veggies (NOT pickle) & reap all the gut health benefits! And, they taste great too! In this class, you will learn the who, what and why about fermenting veggies. Then, you will actually MAKE your own fermented veggies to take home! I'm teaming up with fellow nutrition practitioner Liz Stauffer of Functional Medicine Alliance to bring you this fun class and empowering evening! In-Person AND Virtual Seats are available! 1) Everyone will receive Functional Medicine Alliance's eBook with over 20 recipes for at-home fermentation. 2) Everyone will receive 1 month free membership in Gina's private mentoring group - HappyGut Hacker Community! SPACE IS LIMITED so save your spot today! For in-person students, the exact address in downtown Annapolis will be provided after registration. For virtual students, the link the Facebook private group (where the live class will be held) will be sent to you, starting 1 week prior to the scheduled class. 1) Register to save your spot on Eventbrite on this page HERE. 2) Rsvp to indicate that you are coming on the Facebook event page HERE. 3) For in-person students (so that you have your station to ferment your veggies), bring the simple materials that you will need. The short material list will be provided in the registration confirmation email. For virtual students, if you'd like to ferment alongside with us, collect the materials from the short material list that will be provided in the registration confirmation email. This class takes fermented foods a step further – how to make your own! In this class, see how to make fermented vegetables. HOW do we make and easily incorporate these super probiotic-rich foods in our meals? It’s easier than you may think! Boost your gut health and fermenting confidence! This class briefly explains the who, what and why but focuses on LIVE demonstrations showing you step-by-step EXACTLY HOW to prepare homemade fermented vegetables. You will even have a role in one of the preparations! CLICK HERE TO REGISTER TO SAVE YOUR SPOT! This demo class will show you exactly how to use the Instant Pot for quick, REAL-food, scrumptious meals AND side dishes! Say good-bye to Instant Pot and pressure cooking intimidation! Find out why this is my most favorite kitchen appliance and a must-have for your real food kitchen. This class will focus on exactly how to utilize the pressure cooker function so that you’re confident and ready to create QUICK, high fuel, anti-inflammatory, gut-friendly and delicious food! Early Bird special rates through 6/5/2017! To reserve your spot, go HERE! This demo class will show you exactly how to quickly make smoothies that fuel your body throughout the day. These are not your typical high-fruit smoothies – we’ll be getting creative and staying simple with ingredients and toppings! Think outside the box with these high fuel, anti-inflammatory & gut-friendly smoothies. Tasting samples included. This demo class will show you exactly how to use the Instant Pot for quick, scrumptious side dishes AND meals. Say good-bye to Instant Pot and pressure cooker intimidation! Find out why this is my most favorite kitchen appliance and a must-have for a real food nutrition lifestyle. This class will focus on exactly how to utilize the pressure cooker function so that you’re confident and ready to use your own Instant Pot to create QUICK, high fuel, anti-inflammatory, gut-friendly and delicious food! Tasting samples included. Discover how to increase your daily energy by fueling your body the right way! We'll Explore - The Problem at Hand, Fueling for Success, Food Preparation, Fast Food Options, and Game Planning! Learn all my tips and tricks! RESTART® 5-week VIRTUAL Group Program begins!